Until now I had seen only lotus and wheel as the Buddhist tattoos. 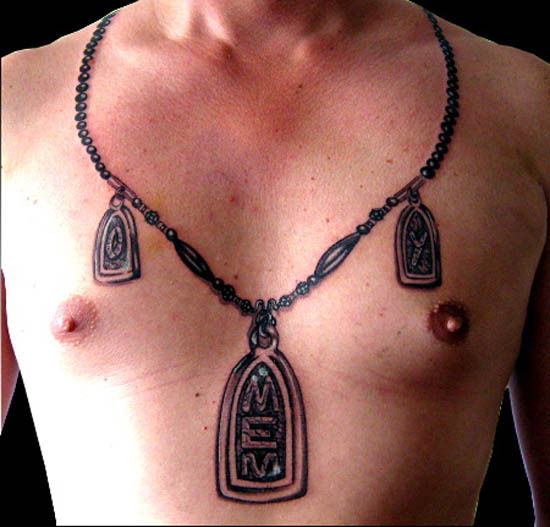 An amulet tattoo is a better idea in this respect. It not only decorates the neck as black-metal-jewelry, but also carries some magical power that helps you in the time of bad luck. Here the middle one contains some Buddhist related alphabetic characters while the smaller two depict some picture. This Buddhist devotee is intelligent enough to ink one talismanic tattoo; so that there is no fear of losing the amulet or any hassle of managing the neckpiece all the time.